This is a picture alphabet book of 104 words in verse celebrating Canadian history and culture and covering all of the provinces and territories. Information about these words and images explaining why they were chosen is included at the back of the book. Another list explaining some of the images is also included. Eh? 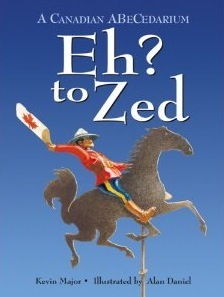 To Zed is a colourful and rhythmic alphabet book that uses distinctly Canadian words from the beginning to the end. Each letter is accompanied with several words starting with that same letter, as well as corresponding images. These images, created by Alan Daniel, are constructed together in a collage form. Following the alphabet are four detailed definition pages, which enable readers to learn the definitions of the words used in the abcedarium.